Fantasy Baseball Draft Prep: What would a first-round bust look like? Even Mike Trout comes with risk attached. Mookie Betts, too. Here are the top picks rated in terms of safety of your draft-capital investment. Something to keep in mind as you get ready for the final weekend of Fantasy baseball drafts: There are going to be first-round busts. It happens every year. We target those early picks for their upside, sure, but also their safety. Nolan Arenado is almost as valuable for the reliability of his Coors-fueled production as he is for the boat loads of homers and RBI he produces. You take him knowing you've got a core piece you won't have to worry about. But things can go wrong. Mike Trout has missed at least 22 games over the past two years. Mookie Betts struggled through a thoroughly strange 2017. Clayton Kershaw, Giancarlo Stanton, Kris Bryant and Carlos Correa were all disappointments among the top-15 draft picks last season, and Joey Votto and Anthony Rizzo couldn't quite live up to expectations just outside that range either. This column doesn't exist to actually call anyone an outright bust, though some certainly have a bit more potential to disappoint. What I want to do here is try to work out what it might look like for first-round contenders to bust, and the likelihood of it happening. Here are the top 15, according to Fantasy Pros' consensus ADP. How could it go wrong? For what I hope are obvious reasons, this is the hardest one to make a case for. Trout has never truly "busted." The only possible case to be made is 2017, when he still hit 33 homers and stole 22 bases with a .306 average and more walks than strikeouts, but only played 114 games due to a thumb injury. Of course, he returned from his only extended IL stint and hit at a 40-homer, 30-steal pace. It's not just the upside here, though that is substantial. It's the consistent excellence. Trout may not be the No. 1 player every single season, but he'll always play at that level. How could it go wrong? Betts has only ever been on the true IL once, when he missed time with an abdominal injury last season (he also went on the 7-day concussion IL in 2015). That almost perfect bill of health tells you all you need to know about the risk here. The only concern is we saw Betts struggle in 2017, when he stopped hitting line drives and starting hitting popups and hit just .264. Of course … he still popped 24 homers and stole 26 bases, had 203 combined runs and RBI, too. Is his worst-case scenario a better version of Andrew Benintendi's 2017? That's fine. How could it go wrong? Ramirez was all out of sorts in the second half of last season, as he stopped making strong contact and started hitting a bunch of popups. That was certainly concerning, and I've seen some in the Fantasy industry discount him for that. The more likely outcome than an all-out regression in skills is a return to his 2017 level, when he didn't hit as many homers or steal as many bases, but was still a borderline elite player. How could it go wrong? He's a pitcher. He's 34 years old. He is a 34-year-old pitcher. He is four months away from being a 35-year-old pitcher. Pitchers are always going to have a higher risk factor than hitters, and older players will always have a higher risk factor than younger ones. Despite what Scherzer's track record suggests -- he has somehow increased his strikeout rate every year from his age-30 season to now -- nobody outruns the aging process forever. How could it go wrong? There are essentially no signs of any coming issues in J.D. Martinez's skill set. He improved his contact rate across the board, and still sports elite batted-ball metrics. He still plays in a great lineup and a good-enough park for his all-fields power. The only issue? He's 31 and has a history of injuries in his past. But he's not that old, and his injuries haven't exactly been of the recurring kind for the most part. Given the elite skill set, Martinez's risk factor is lower than I think he gets credit for. How could it go wrong? There aren't a lot of performance-based reasons to believe Arenado won't live up to expectations, because he has the best buffer in the league: Coors Field. Arenado did see a uptick in his strikeout rate in 2018, so if you want to find a flaw, there's a thread you can pull on. He's still probably going to hit .290 or higher, with at least 35 homers. The only thing that might slow Arenado down is injury, which is true of every player. It's not any more true for him. How could it go wrong? If Turner is more like a .270 hitter with 15 homers and 40 steals, he'll probably disappoint in the first round. However, it's pretty hard to see him doing much worse than that, especially with the Nationals talking about wanting him to run 70-80 times this season. Whether he is just a 40-steal guy or if he can push for 60 probably makes the difference between a top-five finish and a top-30 finish. How could it go wrong? Yelich has never been a bad Fantasy option, but 2018 was the first time he'd ever been an elite option. It wasn't totally unexpected, as a power boost was expected with the move to Miller Park. However, even with Miller's homer-boosting properties, you shouldn't expect anything like what he did last year. If everything else stays the same, except his HR/FB rate drops to his career mark, you're looking at just 21 homers for Yelich last season. And, if his BABIP regresses to his 2017 level, you're talking about more like a .285-.290 hitter. Again, nothing about that is bad. But it's not gonna be worth that first-round pick. How could it go wrong? Young players generally have wider error bars when it comes to their projections, and Acuña's aren't any thinner than any others. We know he'll hit for power. We assume he'll run, though there is no guarantee of that. The Braves have pretty consistently restricted their stolen base attempts to the top two spots in the lineup, and Acuña is expected to hit fourth to start the year. However, his strikeout rate could be a problem, which could give him a batting-average floor more in the .250 range. Most projection systems have him in the .270-.280 range, with around 30 homers and 25 steals. Those would be excellent numbers, but if pitchers find some holes in his swing and the strikeout rate creeps up, or he's more like a 15-steal guy, you're probably not looking at a big difference between Acuña and someone like Cody Bellinger or George Springer, going three rounds later. How could it go wrong? We start with injuries. DeGrom is a Tommy John survivor, and was limited to just 148 innings in 2016 by elbow issues that ultimately required surgery. Plus, he's a pitcher. DeGrom has always been good, but last season was out of this world, something he isn't likely to repeat. He's being drafted as the No. 2 pitcher off the board but has typically been more of a No. 9-10 finisher when healthy. Drafting off a career season is always an easy way to get burned, although the downside for a healthy deGrom is still probably a top-15/20 pitcher. The risk is relatively minimal for a pitcher, as long as you're not expecting a repeat. How could it go wrong? Injuries, obviously. Sale took his game to yet another level in 2018, posting a 1.98 FIP, thanks in part to a massive midseason jump in velocity. However, he wasn't able to hold on to those gains, nor was he able to hold up physically, as he suffered a shoulder injury late in the season. It was never considered serious, and he looked good in his brief spring training appearance. However, that's a true warning sign for a pitcher who has racked up some big innings totals in recent years. How could it go wrong? Well … He's currently hurt, so rushing back before he is fully healed is one way. And, with Lindor talking about being in the lineup on Opening Day, there is a real concern there. Even if he plays, is it safe to assume he'll be himself? Or that he won't suffer a setback? Otherwise, it wouldn't be a surprise at all to see Lindor run less coming off this injury, after breaking out with 25 steals in 2018. If his homers come back down to Earth too, there may not end up being a huge difference between him and someone like Gleyber Torres. How could it go wrong? See: 2018. His power regressed and he stole his fewest bases ever in the majors. He was still good, but he was certainly a disappointment for his draft cost. The good news is, he had surgery this offseason to repair the knee injury that clearly bothered him in 2018; the bad news is, he's coming off knee surgery. How could it go wrong? It's all going to come down to sustaining last year's power gains. Bregman went from 19 homers and 63 extra-base hits in 2017 to 31 homers and 83 extra-base hits. It wasn't exactly a stunning outcome from a young player with his pedigree, and he did pair it with a huge improvement in plate discipline. However, his batted-ball profile doesn't necessarily back that up, suggest slightly-above average power, as opposed to elite. His well-rounded skill set means Bregman is unlikely to totally bust, but if he goes closer to his 2017 levels, you're going to be disappointed. How could it go wrong? See: 2018. Also See: 2017. Also See: 2015. 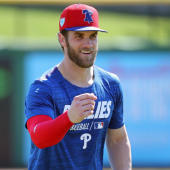 It wasn't the same issue each time for Harper; one year, it was an injury he tried to play through; the next was an MVP season derailed by a different injury; last year was a mix of bad luck, struggles against breaking pitches and with the shift. Put it all together, and it's three disappointing seasons for Harper. A disappointing season for Harper is still quite a bit better than most players' best, but it'd be foolish to ignore the variance. Of course, if you ignored it, you would take Harper No. 3 overall. That's how high the upside is.